No to Angelides and Schwarzenegger! Yes to Janice Jordan! Angelides criticized Schwarzenegger for his praise for the racist anti-immigrant vigilantes called the “Minutemen” while in the same breath calling for a "guest worker" program that would create a new class of super-exploited worker with no political rights. Under the same type of program in the past U.S. bosses often failed to even pay Mexican workers for their hard labor. The fact that Angelides and the Democrat Party are now calling for this kind of legalization of indentured servitude place them firmly in the same racist camp as Schwarzenegger. No to Angelides and Schwarzenegger! Last night’s debate between Phil Angelides and Arnold Schwarzenegger was a grueling hour of corporate politics. Angelides leveled criticisms against Schwarzenegger for cuts to education under his governorship. Schwarzenegger countered by asking where Angelides was when Democrat governor Gray Davis was making cuts to education and asked why Angelides supported those cuts under Davis. Schwarzenegger went so far as to ask why Angelides didn’t join in the student protests for education that had marched by his office under Davis. It was a valid criticism, yet Schwarzenegger never supported those student protests either and as Angelides pointed out, he has made his own cuts to education. On a similar note Angelides criticized Schwarzenegger for his praise for the racist anti-immigrant vigilantes called the “Minutemen” while in the same breath calling for a "guest worker" program that would create a new class of super-exploited worker with no political rights. Under the same type of program in the past U.S. bosses often failed to even pay Mexican workers for their hard labor. The fact that Angelides and the Democrat Party are now calling for this kind of legalization of indentured servitude place them firmly in the same racist camp as Schwarzenegger. What was missing from the debate was the voice of an official candidate that will be on the ballot in November, but was excluded from the debate by the California Broadcasters Association. This candidate, Janice Jordan of the Peace and Freedom Party, could have chimed in that she did in fact support the protests against the cuts of both Davis and Schwarzenegger and that she opposes both the racist Minutemen and the racist guest worker program. But she was excluded from the debates, showing once again the bias of the corporate media as a pillar in preventing true democracy in America. A truly democratic society would eliminate corporate control of the elections by nationalizing the corporate media and allowing all candidates equal access to the airwaves, cable, and print. Likewise a truly democratic society would carry out a sweeping “campaign finance reform” through the nationalization of the means of production (using that wealth for human and environmental needs rather than decadence and deception). It will take a socialist revolution to bring democracy to America. Liberation News sees the participation of socialists in the corrupted electoral politics of America as a critical platform in explaining how we differ from the capitalist Democrat and Republican parties. Likewise all of the undemocratic measures that are used against us, which will only intensify as we grow stronger, expose the parallel need for a revolutionary program to accompany any socialist electoral activity. The Peace and Freedom Party is primarily an electoral party that speaks of the need for socialism, but generally avoids talk of the only step that will bring socialism, a step that can be summed up in one word: revolution. Revolution is about abolishing the current racist anti-worker and anti-poor police, military, and judicial system and carrying out a sweeping redistribution of the wealth. Likewise the campaign literature the Peace and Freedom Party hand out at demonstrations often contain good criticisms of the Democrats and Republicans and outline a good platform for social and economic emancipation, but are usually missing another key component that will make putting human and environmental needs before profits possible in a socialist society. That being the nationalization of industry including oil (and other energy), “defense”, auto, the banks, the railroads, chemical, and the agricultural monopolies. It is due to this lack of a true socialist program in the Peace and Freedom Party, and lack of any campaign statements from Janice Jordan countering it, that Liberation News can only give critical support to the campaign of Janice Jordan. In giving this critical support to Janice Jordan we recognize that the social reforms called for by the Peace and Freedom Party do still have a revolutionary component in that they go far beyond anything that the capitalist class of the United States will ever allow short of their total overthrow. 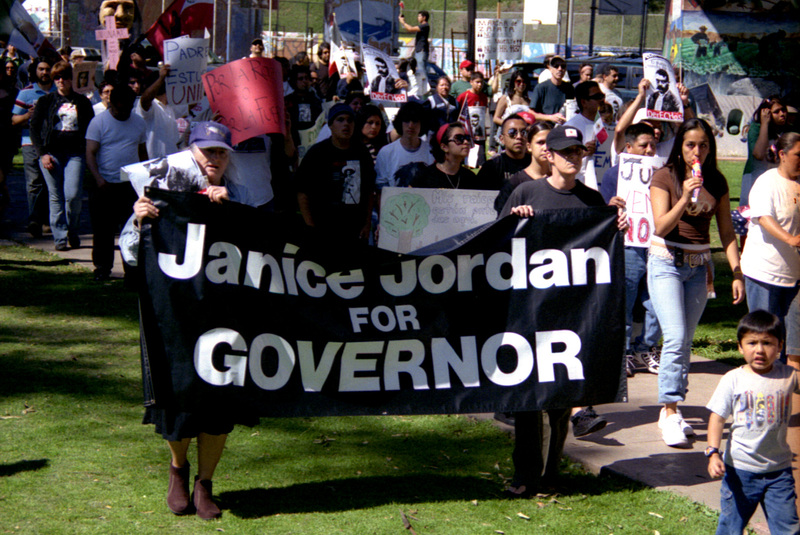 In giving critical support we intervene to denounce the undemocratic actions of the corporate media and capitalist campaign financing used against the campaign of Janice Jordan, but unlike the Peace and Freedom Party, we take those undemocratic actions to their logical conclusion: the ultimate need for socialist revolution. While giving critical support to Janice Jordan’s campaign for governor, Liberation News is withholding support for the Peace and Freedom Party’s candidate for Lieutenant Governor, Stewart Alexander. Alexander’s campaign is spreading illusions in the Democrat Party. In his campaign statements Alexander pretends that the Republicans represent corporate interests and that the Democrats do not, their problems being "sitting on the fence" and an unwillingness to spend "political capital". This is nonsense; the Democrat Party is just as much a corporate party as the Republican, both in its financing and in its program. In another campaign statement Stewart Alexander opposes the Peace and Freedom Party’s platform that calls for immediate withdrawal from Iraq from the right. In the statement he claims that the Peace and Freedom Party needs to draw up an exit strategy from Iraq. Yet immediate withdrawal is an exit strategy. It is an exit strategy that takes no consideration of continuing to prop up the undemocratic puppet death squad government the U.S. established, nor does it consider the logistical needs of keeping troops fighting and dying in Iraq to defend military hardware as it is evacuated. Troops are to be evacuated immediately by air, sea, and land the same way they were sent in; and the biggest cause of the bloodshed in Iraq will be gone. This is the exit strategy. Liberation News calls for U.S. troops out now! Build the mass movement! For the labor movement to break from the Democrat Party of war and exploitation and to end the war through building the mass movement in the streets; striking against arms producers; hot cargoing war materials on the docks, trains, and trucks; and building towards a general strike against the war. For the right of military personal to refuse orders and resist this war. For student actions against recruiters, such as those at UC Santa Cruz that have repeatedly driven military recruiters off campus. For building the socialist movement as part of the anti-war resistance today and to ultimately end U.S. imperialism through socialist revolution. While Phil Angelides and Arnold Schwarzenegger will carry out austerity connected to the U.S. war in Iraq and the economic problems of capitalism, neither the Democrats nor Republicans offer any solutions to the problems of war and capitalism because they support both. Vote Janice Jordan for governor! Money for social and environmental needs, not for war and capitalist profit! For socialist revolution to end imperialism and establish democracy in the United States!